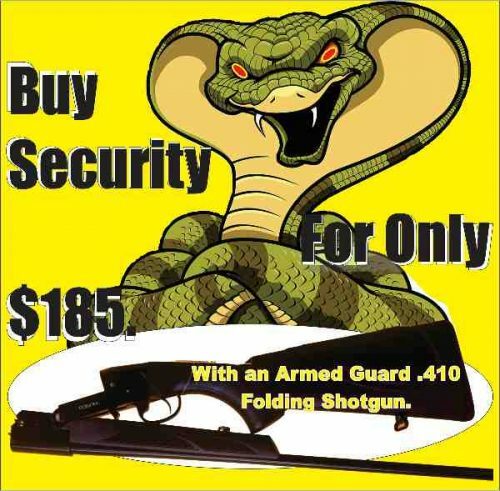 DO YOU WANT TO SELL YOUR GUNs? You too can advertise here. 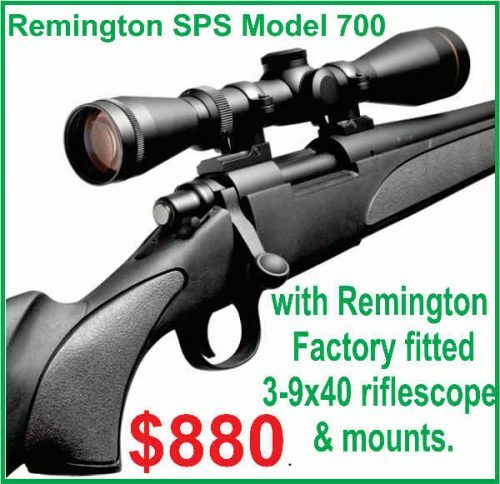 Remington Model 700 SPS, with factory fitted Rifle scope 3-9×40 Trophy scope in .308 w & .243 and a 4-12 x 40 Trophy with the .223 and both include mounts. $880. SHS Bolt Action 12 Gauge Shotgun, straight pull spring return, Not Semi Auto, Category A. Synthetic Stock only 2 left. More stock will be a two weeks away. Chrome Barrel. The 2 million licensed shooters in Australia can make this happen. At the last federal election there were 13 million voters and our shooting companions are nearly 18 % of them, that is enough for us to chose which government rules this country. We are now the largest single interest group on the Australian political landscape, we just have to be the best organised lobby group. 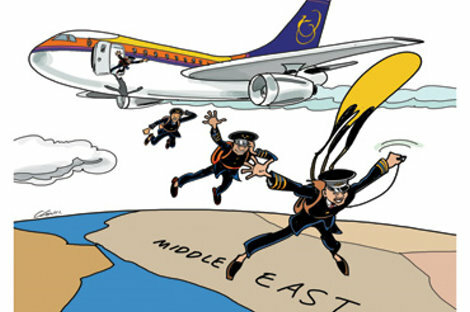 Of course the main party hacks will bring out that old furphy, ‘if the aircraft is having a few problems would you ask farmer plod sitting in the back economy seats to come and fly the plane.’ Besides, it’s not being relative and just an rhetorical trick, if we made a simile between the plane and our country, our pilots – sold out to another country, baled out and left us in a screaming power dive towards the rocks, anyone who pulled up the joy stick and levelled up the plane would be appreciated and loved by all the passengers. We do not need professional politicians, we need honesty. Not political guile, we need commitment to our cause, or we are wasting our time and energy. The LNP, knows it has to oppose the Adler Ban or it will drive 600,00 voters into supporting One Nation. They also know that if they oppose it, as the numbers are not there for their Labour Government either the Premier dumps the National Firearm Agreement (betrayal) and keeps governing or has to go to an election. Read the Latest NFA 2017 Click This Link and then Contact both your State and Federal MPs. Because you won’t be happy. This document is not Law, its not Legislation, its just your politicians have agreed to impose it on Law Abiding Citizens. You can stop this, tell your friends. One Nation is changing its policy to reflect the end of the NFA, the end of Permits to Acquire, if it does not do this soon we have a host of other new parties to chose from. Just direct your preferences away from the international socialists and vote for KAP or Shooters Party, or Liberal Democrats. In Queensland, instead of an Adler Ban we have an election, and an election that more than likely will ensure that the Adler Ban never happens. An election that turns this whole country around. We might not get the leader this country needs in this election, but we have a chance to take back our country from international policies, so we must work for it. They were imposed on us like a black cloud in 1996 and the suppression became worse in 2003, if we break it in Queensland the NFA will fall apart like a deck of cards. The Rights our forefathers won with blood, four hundred years ago, the right to defend our families and ourselves, the right to own the property gained by our effort, the right to chose who we allow into our country, the rights to freedom of speech. All were taken from us within those few years. It has been a long road back, but now we have the numbers and at last the people have the ability to freely view what is happening in the world, instantly. The people of Australia need a genuine leader like the ex coal miner Andrew Fisher, Member for Gympie who established the Commonwealth Bank, The Royal Australian Navy, who fought for the ‘White Australia Policy’ and resigned as Prime Minister when his own party wanted National Conscription. He might not have been right on all issues, but he was a fierce patriot and had the courage of his own personal convictions. We don’t want our leaders changing the original oath to go into parliament, we don’t want them taking the oath on the Koran or giving allegiance to Islam, or the United Nations. We need a leader that can prove that they have a personal emotional bond to our country and its history. That they love Australia and its flag. That they love Australia from the depths of their heart and soul. That this country carved from the wilderness by our founding fathers will never submit, never give up its freedoms, never fall under the control of the internationalists, or Islamic’s. A leader who will oppose blow for blow the extreme violence and restrictions of liberties that multiply throughout our country from the growth of Islamist fundamentalism. That they understand the worry of millions of parents each day about the state of our country and the world we will leave as a heritage to our children. That they will fight to restore the ancient liberties, the rights to property, the right to defend oneself and their families, the right to defend that property, the right to free speech, that the punishment should fit the crime and not allow the victims to be confronted by criminals who are now defended by the law. This leader must believe and say that they are first and foremost an Australian, that they personally understand the people’s misery, the feelings of insecurity, from perpetual violence. Australia has been torn apart by two savage dogs, criminals on one side and the government on the other. Australians must chose either to continue with those who have lied, failed, and betrayed them, or decide to put Australia back in order and in the hands of the people. They must say that they want to live in the old free Australia, a secure, prosperous, united, just, proud Australia. It’s your choice, we now have the numbers, if you want it to happen, we have to get motivated, write to politicians inform them of your opinions, what you require of them, ask them what they are going to do about it. If you find one that you believe will do the job, work hard to get them elected, but vet them carefully. For instance, in the current One Nation policy as of Sunday the 19th of February 2017 it still has the words, “Current gun laws are adequate and should remain unchanged”, Repeatedly, I have been informed by candidates and senior party officials that those words will be removed and a new policy will be circulated but nothing yet has occurred. In the late 1990s we had a One Nation candidate in Gympie who had a meeting with all the local shooting clubs and pledged his allegiance to improve gun laws, we recorded the meeting, a few days later we had one of our members phone the candidate up making out that he was anti gun and that he did not want Australia to go like the USA. Of course our Gympie One Nation candidate swore black and blue that he was for strict gun controls and could not see any reason at all for anyone to own more than a shotgun or .22. This too, we recorded and sent both recordings to One Nations headquarters in Brisbane, asking for the candidate to be replaced. They would not do this, so we ensured that he was never elected for parliament. We shooters here in Gympie have helped One Nation in other electorates. Empire Building Police, minimise shooter licence numbers so that Politicians do not become afraid of the electoral fall out from Extreme Dictatorial Gun laws. Then maximise shooter licence numbers to 600,000 to explain why shooters wait for seven months for a licence, or when asking for more staff and a greater slice of the tax payers budget. Shooters Union Queensland wrote to the Police Minister asking, How many licenced shooters were in Queensland? They were told that the 230,000 reported in the media was an incorrect figure as some shooters, such as pistol shooters had two licences. The real figure was 190,000. When Firearm Designers Collectors Association Inc asked Weapons Licencing at a meeting in 2015, how many licenced Pistol Shooters were in Queensland we were told 6000. Yet they allowed 40,000 for the above doubling up on licences? Would the Queensland Police really purposely lie to protect their Empire in Weapons licencing? It certainly seems that way. Judy Cochrane Electorate Officer for Trevor Ruthenberg MP Kallangur. When Queensland Police want to minimise the effect of the Firearm Vote to Politicians they have 200,000 shooting licences, when they want to maximise the amount of work to get more staff, or more money they have 600,000 shooting licences. Simple really, but this time they are not just lying to the media, or a shooting body, this time hopefully they have told the truth. As just after this licencing system began in Queensland back in 1997 Inspector Mc Comb OIC weapons branch reported that we had 195,000 shooter licences back then and the Police admitted for many years a 16 % increase, so on that increase it look like the 600,000 figure will be the correct one. As The Police Minister has used that 600,000 figure in his letter, not just to Mr Doyle but to his local Member of Parliament Trevor Ruthenberg MP and lying or just misinforming parliament is a big offence. They get removed from parliament for things like this. The Queensland Police know well that 600,000 voters and their families and friends can change their world. As only 2,445,815 voted at the last state election, Licenced Shooters could effect over half of those votes. We are no longer a minority. On page 29 of the Crimtrac Annual reports 2015 there was 1.9 million licenced shooters in Australia and 5 million firearms. Latest figures from Crimtrac’s 2016 report, which due to amalgamating two separate systems delayed the reporting for the full year was Number of Firearms 5,798,980 and Number of licenced firearm owners 1,973,522. We are now in 2017, their figures would be already a year old so we would have in excess of 2 million shooters in Australia. 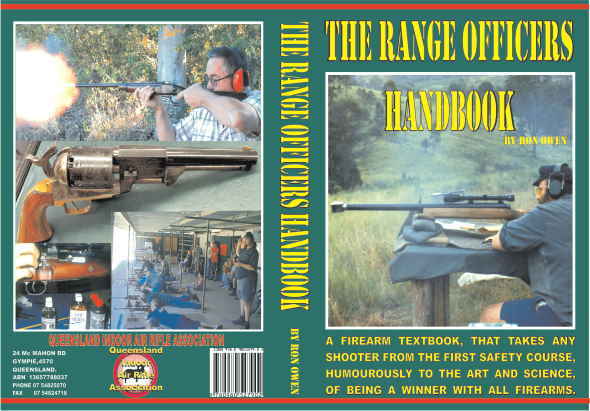 Many people still legally shoot as visitors at rifle ranges and clubs. Many employees of farmers use firearms on their employers licence. With 2,000,000 shooters in Australia, could there honestly be only 190,000 in Queensland, that’s less than 10 %, in one of the largest shooting states. Only NSW would have more than us, and Queensland has been inundated with ex-Victorians. Further evidence as to large numbers was received in March 2016. Note, he states a 50% increase in licence applications not 27 % as what was recorded Nationally in the Crimtrac Report. Why does he say that this is a “significant concern”? Well that equated to 18,200 applications per year and when it increases at 50% per year in five years time that is an extra 90,000 applications per year. That 18,200 applications per year is a statement in itself that the 190,000 figure is not enough. Further Evidence that Queensland Police are playing ducks and drakes with the Firearm Register numbers is from our local MP. and in Queensland (broken down by post code)? “Astonishingly, the Minister could not answer. “He said that the body in charge of all our weapons licensing, the Queensland Police Service Weapons Licensing, had advised that the numbers were imprecise as multiple categories may be registered to one licence and multiple licences may be registered to one person. 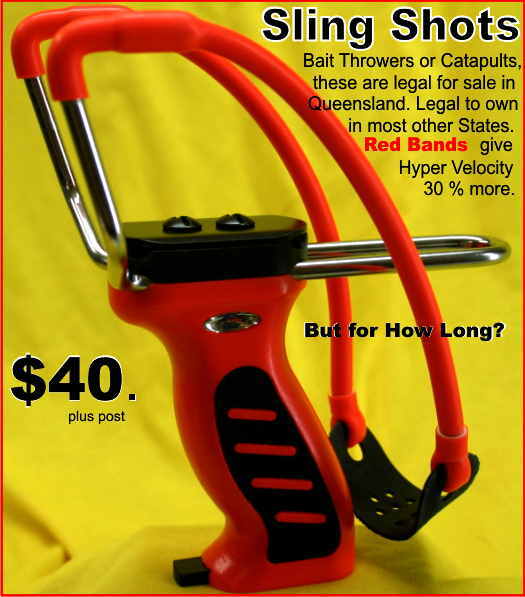 “In other words they have absolutely no idea of how many weapons holders are in each region in Queensland. Yet the Weapons Act 1990 says they have to know. (1) The commissioner must establish and maintain a record (the firearms register) of all firearms in Queensland. Maintaining that register is the cause of all the pain and derision of Permits to Acquire, $37.00 fees and Form 10s, countless hours of time spent at Police Stations, and Police visits to your homes, checking that the guns on your list are registered to you. Should the same penalty that applies to Firearm Dealers be applied to the Police Commissioner? (1) A licensed dealer or licensed armourer must keep at the premises stated on the licence a weapons register. Maximum penalty—20 penalty units or 6 months imprisonment. (2) A licensed dealer or licensed armourer must, for each transaction involving a weapon, enter immediately in the weapons register the particulars prescribed under a regulation. Maximum penalty—20 penalty units or 6 months imprisonment. If they do not have precise numbers of licences, they must not know who has a licence, so what is the point of putting thousands of voters through the pain and derision of compliance? This should cause flashing lights in a real journalist brain as it’s an obvious lie to cover up the numbers. Then a few weeks ago we had Jackie Trad the Labour Deputy Premier using the tragedy of the Lindt Café siege to score political points again targeting law-abiding firearm owners. Trad posted on her Facebook page on January 28, and tells her simple followers that “after the Martin Place siege, a coronial inquest found that a review needed to happen over lever-action shotguns, like the Adler shotgun”. When in fact the Martin Place Siege Review Recommendations Page IX it stated. The Senate Legal and Constitutional Affairs References Committee, on Ability of Australian law enforcement authorities to eliminate gun-related violence in the community. They met over an 18 month study and investigated over 400 submission, including submission from every State police force. In April 2015 it gave its findings in Commonwealth of Australia document ISBN 978-1-76010-187-9. STOP THEM STEALING OUR RIGHTS AT THE NEXT ELECTION. 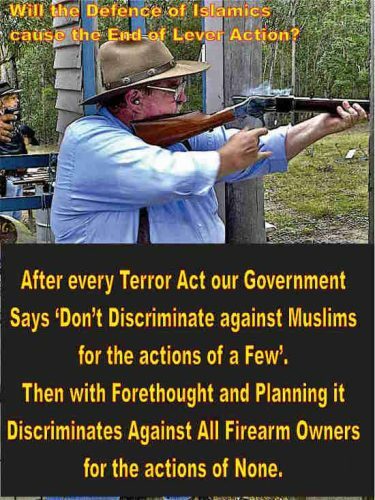 Yet again we have this Jackie Trad using law abiding firearm owners as the whipping post, not for an instant would she see the hypocrisy of her saying “That we should not discriminate against Muslims for the actions of a few”. When firearm owners are discriminated, fined, penalised, oppressed, property taken, when we are totally innocent. We are tired of being the ‘Scapegoats’ we are made to feel like their “Whipping Dogs’, when politicians have problem, they make excuses for the guilty and go out and Whip licensed firearm owners again. Yet again government is protecting the guilty and punishing the innocent. Governments for years have written to me and many of our FOAA members stating, “Strike a balance between the interests of licensed Gun Owners and the need of the broader community to live safely and securely”. Then they blame, the “Heightening threat environment.” yet instead of addressing the problem, Governments collectively have committed to import hundreds of thousands of more Islamic threats. So law abiding firearm owners suffer constantly for all governments decisions. Now is the time for change. 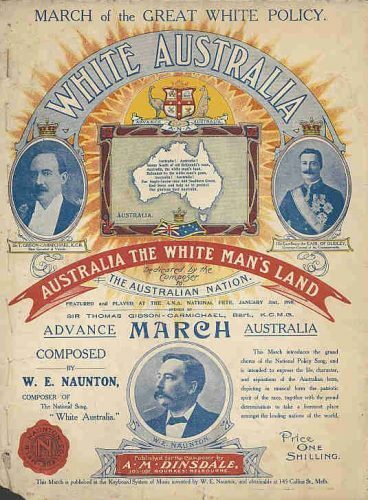 Bring on this election, work hard to remove the National Firearm Agreement, end Long Arm Registration and look forward to a return to the Australia we used to be proud of. 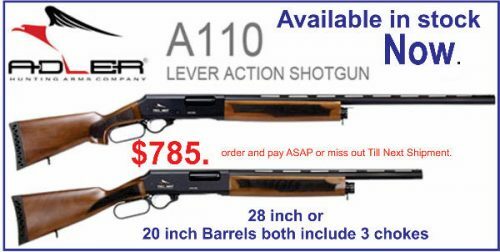 Adler 12gauge Lever action Shotgun $785. 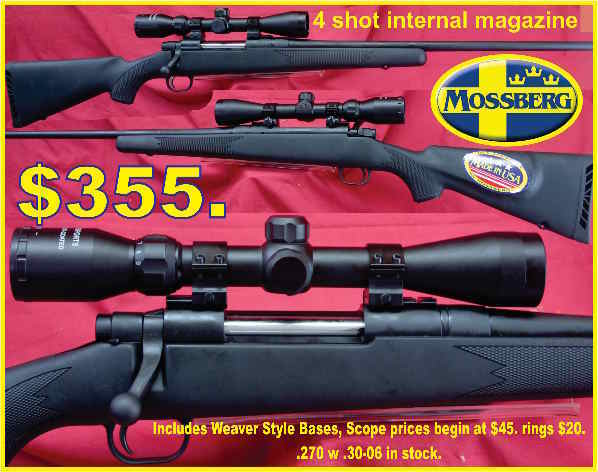 only 28 inch barrels left in stock.